Fires don’t burn forever. Not in the physical nor in the spiritual. I want to share some true things that the Lord has revealed to me since He opened my eyes and ears to hear His words that are all spirit. The fire of God is His word as we will see and it is indeed a blessing for us to learn and be taught to abide in this fire. Look at these verses from Isaiah 33 which foretell of this mystery. Is this speaking of who will be in eternal hell? Absolutely not. The people who will be dwelling in everlasting fire are not the wicked sinners as taught by Babylon but are in fact the true people of God who have had the fire clean them up and burn out of them all things that defile. Look at how the Holy Spirit answered the question about who should dwell in this “everlasting fire”. It is not people being tormented for their sins. Those that are in this “fire” are the ones walking in righteousness having their old man destroyed, dying daily, getting their mind renewed daily by the fire of God’s word that abides within them. The people in this fire are God’s very Elect, the ones HE is saving now in this age. Judgment begins at HIS HOUSE. This is such a revelation if you can receive it. The traditions of the orthodox churches have nothing right and the doctrines they teach and we all first learn are truly another gospel and a different gospel. If you know what bread and water represent in Scriptures then you will see the total apostasy in the professing orthodox churches of men. When we are yet carnal and looking at Scripture thru the veil of flesh, we will not see anything correctly even though we all will vehemently argue otherwise. But a day will come when that veil is removed and then we will truly come to appreciate that the Scriptures don’t mean what they say, they mean what they mean, and that meaning must be given to us by faith. Christ’s words are not to be taken literally, outwardly by the letter. They are Spirit. So the truth and the knowledge of the mysteries of the kingdom are given to very few as many are called but only a few are chosen of the Lord. Eternal hell is a lie, one of just millions we all first learn in Babylon. The fact is that “FIRE” is an attribute of God and HIS WORD, that has both positive and negative applications in Scripture. The word of God is likened to a sword that has two edges and this refers to the positive and negative applications of all words of Scripture. Heb 4:12 For the word of God is quick, and powerful, and sharper than any twoedged sword, piercing even to the dividing asunder of soul and spirit, and of the joints and marrow, and is a discerner of the thoughts and intents of the heart. Fire is negative in that it brings destruction and destroys the old man and the carnal mind. Fire is positive in that it purifies us and burns out all the sin and inequity from our hearts and minds. But the natural man cannot receive the truth of God’s word, it is foolishness to him. I pray you are given eyes to see and ears to hear these truths and will come to believe the good news of the one true gospel. Let’s begin with some Scriptures that tell us of the character of God. He is a devouring fire. This is far from the only characteristic of God. Indeed they are many others and they include such other attributes as love, mercy, and long suffering to name a few. So carnal men make the mistake of twisting Scriptures to their own destruction. It is the sum of God’s word that represents the truth. Yet carnal men have taken Scriptures by themselves, violating these two principles of God’s word and to the exclusion of other Scripture have invented their own doctrines. Doctrines and spiritual truths we take to heart are what we eat spiritually speaking and when we do this in Babylon, we are making our own bread and have not the doctrines of Jesus Christ. With 2,000 years of Apostasy behind us, carnal man has truly maligned the nature and character of our great God. Deceivers have only waxed worse and worse, deceiving and being deceived. The doctrine of eternal torment and man’s free will to choose God are gigantic doctrines of devils which point away from the Cross and the Lord Jesus Christ. Such doctrines do not conform one to true godliness but instead keep the beast that all men are safely enthroned in our hearts in the place of the real Jesus. This is not somebody else or some man to come in the future, this is you and me and all men. Rev 13:11 And I beheld another beast coming up out of the earth; and he had two horns like a lamb, and he spake as a dragon. Fire, which stands for the WORD of GOD is what brings judgment upon us. And hopefully we do know that Jesus Christ is this WORD and that He came to save the world and will do so in due time by the process of judgement. Joh 12:47-48 And if any man hear my words, and believe not, I judge him not: for I came not to judge the world, but to save the world. He that rejecteth me, and receiveth not my words, hath one that judgeth him: the word that I have spoken, the same shall judge him in the last day. This coming of Christ to us a second time is very bad news for the old man but for the new man that the Lord is bringing forth, it is very good news. It is the love of God in action as He remakes us and chastens us with His grace. Matthew 3:10-11Therefore every tree which does not bear good fruit is cut down and thrown into the fire. 11 I indeed baptize you with water unto repentance, but He who is coming after me is mightier than I, whose sandals I am not worthy to carry. He will baptize you with the Holy Spirit and fire. Heb 9:28So Christ was once offered to bear the sins of many; and unto them that look for him shall he appear the second time without sin unto salvation. Every son God receives in this age is scourged with this fire. This is the true baptism into Christ’s death and it comes from the Almighty as the destruction of our flesh and carnal mind. This is completely opposite of what Babylon teaches us. Here is what the word of God working in our lives works. Heb 12:6For whom the Lord loveth he chasteneth, and scourgeth every son whom he receiveth. Act 14:22 Confirming the souls of the disciples, and exhorting them to continue in the faith, and that we must through much tribulation enter into the kingdom of God. The judgment of God is said to be sweeter than honey for the new man and it begins at the house of God. It is a blessing for the fire of God to come upon us and burn out all that defiles. Eternal torment is such a damnable heresy. Psa 19:9-10 The fear of the LORD is clean, enduring for ever: the judgments of the LORD are true and righteous altogether. More to be desired are they than gold, yea, than much fine gold: sweeter also than honey and the honeycomb. God’s love converts all His enemies, which is all that are carnal minded at enmity with God, into His friends. The vehicle for this conversion and transformation is the righteous judgment of God. Psa 66:3Say unto God, How terrible art thou in thy works! through the greatness of thy power shall thine enemies submit themselves unto thee. Joe 2:1-3Blow ye the trumpet in Zion, and sound an alarm in my holy mountain: let all the inhabitants of the land tremble: for the day of the LORD cometh,for it is nigh at hand; A day of darkness and of gloominess, a day of clouds and of thick darkness, as the morning spread upon the mountains: a great people and a strong; there hath not been ever the like, neither shall be any more after it, even to the years of many generations. A fire devoureth before them; and behind them aflame burneth: the land is as the garden of Eden before them, and behind them a desolate wilderness; yea, and nothing shall escape them. Fire is good to the new man and very bad for the old man and carnal mind. These words of Christ speak of His wonderful works to the children of men. This is how we are sanctified, it is thru the process of coming thru the fire. Even this verse from Matthew, always misquoted due to the carnal translation of “aionious” as everlasting; speaks of God’s chastening grace that will save all men in the end. Being sent into the lake of fire is how all men except God’s very Elect will be saved in the 2nd resurrection. Do any research and you will see that brimstone is a purifying agent which is the very purpose of God’s fires. I hope you are beginning to see that the fire of God is what brings judgment to us. It is very good yet we will never be judged unless and until we can hear the words of the Lord in Spirit. We must have ears to hear and we only get them in the last days of our carnal age when judgment comes upon us. Fire is God’s instrument of salvation and that simply is HIS WORD, which must be heard with God given ears to hear to begin to work its purposes in our lives. That purpose will be our sanctification. 1 COR 3:13-15 each one’s work will become clear; for the Day will declare it, because it will be revealed by fire; and the fire will test each one’s work, of what sort it is. 14 If anyone’s work which he has built on it endures, he will receive a reward. 15 If anyone’s work is burned, he will suffer loss; but he himself will be saved, yet so as through fire. Maybe now you can understand the Psalm 19 that spoke of God’s judgments as sweeter than honey and more desirable than gold. God’s purposes with fire is always for good. The belief of a fire that never goes out and burns without end is not in the Scriptures and is an invention of the carnal mind adopted from ancient pagan doctrines. All men shall be saved, that is the promise of God and that salvation will come by the very same fire the blind multitudes of orthodox Christianity claim will burn people in hell forever and ever. He is the LORD and called the Almighty and in Him, we live and have our very being. This is what God wants and He will get and His word, the fire will perform its work in the appointed times for each of us. God is longsuffering, He is patient, His mercy endures forever. He is not waiting on any man to choose Him, God is working all things for the council of His will. Pro 16:9 A man’s heart deviseth his way: but the LORD directeth his steps. Jesus Christ will ultimately be the Savior of the whole world but He is not now saving the entire world. For now and in each generation since Christ, His Elect, the few chosen from the many called are who Christ is saving. 1Co 15:23But every man in his own order: Christ the firstfruits; afterward they that are Christ’s at his coming. Jesus wanted to get on quickly with building HIS church by bringing judgment via this fire onto the very Elect. This fire lights our earth on fire when we are given our ears to hear by the precious gift of faith. I have been lit on fire by the power of God. Luke 12:49I have come to cast fire upon the earth; and how I wish it were already kindled! Isa 26:9 ... for when thy judgments are in the earth, the inhabitants of the world will learn righteousness. Isaiah 48:10 Behold, I have refined you, but not as silver; I have tested you in the furnace of affliction. Being refined in a hot fiery furnace is not fun for the old man. There is much suffering involved, which is the walk of God’s chosen Elect. We must suffer as our Lord suffered and it is by this suffering we will learn obedience. So much for the false prosperity gospel. God is not in the flesh blessing business, He is in the business of destroying flesh and blood and remaking us by the fire of His word. God’s fire is like a refiner’s fire. Its whole purpose is not to punish people as the demonic doctrine of eternal hell puts forth. No, God’s purposes are always for good, ALWAYS, and God’s fire is there to draw people to Him and to purify us into the divine nature that is God. The Prophet Malachi spoke of Jesus coming and likened this to a refiner’s fire. Malachi 3 – But who can endure the day of His coming? And who can stand when He appears? For He is like a refiner’s fire and like launderers’ soap. 3 He will sit as a refiner and a purifier of silver; He will purify the sons of Levi, And purge them as gold and silver, That they may offer to the Lord An offering in righteousness. 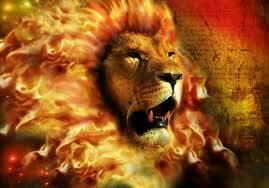 When God puts His spirit in us, He puts in the fire that will consume the adversaries of the Lord. All the enemies of God and things in our land, which means in our hearts and our minds, the things that defile our temples of the Lord will be burnt up eventually thru this process. This fire cannot be put out by man or his delusion of free will. It will burn up the tares, which are the false doctrines we believed out of our land. What God has started in us, He will finish the job. Jeremiah thought he could thwart the will of the Lord just like Jonah did and not speak this word. Jer 20:9 Then I said, I will not make mention of him, nor speak any more in his name. But his word was in mine heart as a burning fire shut up in my bones, and I was weary with forbearing, and I could not stay. But as Jeremiah and Jonah both learned, the zeal of the Lord is that word burning in us and it will consume us and purge the old man, that man of sin out of our heart. I hope you have eyes to see clearly the purposes for all of God’s judgments. They are used to purify His sons and daughters, not to torment them FOREVER. His anger is but for a short time as the Psalm 30:5 tells us. The character of God has been greatly stained by carnal man and this doctrine of eternal hell. You will be ashamed you ever believed it when your eyes are opened to the truth. Jesus is our HIGH PRIEST and sits in our heavens with the Father. Priest make a propitiation for sins and Christ was such for not only the sins of His Elect but for the sins of the whole world. God’s chosen Elect are the kings and priests of the Lord and if we are found faithful will rule and reign with Him during the Millennium reign on earth. In the interim we will overcome and gain dominion over sin. Rev 5:10 And hast made us unto our God kings and priests: and we shall reign on the (our) earth. The role of a priest in Scripture as the sum of thy word tells us is always to put fire on the altar of God. Let’s look at God’s instructions to His priests. Leviticus 1 – The sons of Aaron the priest shall put fire on the altar, and lay the wood in order on the fire. 8 Then the priests, Aaron’s sons, shall lay the parts, the head, and the fat in order on the wood that is on the fire upon the altar; 9 but he shall wash its entrails and its legs with water. And the priest shall burn all on the altar as a burnt sacrifice, an offering made by fire, a sweet aroma to the Lord. The hearts of the people, ours included are the wood as we will see below. This is nothing more than us becoming a living sacrifice and having the word of God, the fire, burn up our old man. We die daily as we are crucified with Christ. This is what the fire does it consumes the lusts of the world, lusts of the eyes and the pride of life in us. The fire kills us and fulfills our needing to lose our life to gain it. Mat 10:39 He that findeth his life shall lose it: and he that loseth his life for my sake shall find it. God uses His few chosen ones, the very few among the many called, to be the very fire. The Elect of God that have this fire burning in them are the BODY OF CHRIST. They are the angels or messengers of God are cast fire down to the earth. This is all symbolic language that speaks to us speaking His word, that is the fire. Rev 8:5 And the angel took the censer, and filled it with fire of the altar, and cast it into the earth: and there were voices, and thunderings, and lightnings, and an earthquake. God’s Elect are these angels and are these ministers. We are the salt of the earth, and we rain fire down on this earth by preaching this gospel. This applies first to our own earth, inwardly but also to the few sheep and lambs the Lord will send our way. We feed them His word, which is a fire. Jeremiah 5:14 Wherefore thus saith the Lord God of hosts, because ye speak this word, behold, I will make my words in thy mouth fire, and this people wood, and it shall devour them. This is what will turn the hearts of the people back to God when they believe. The priest of God will never stop speaking words of fire. Leviticus 6:11-13 and the fire on the altar shall be kept burning on it; it shall not be put out. And the priest shall burn wood on it every morning, and lay the burnt offering in order on it; and he shall burn on it the fat of the peace offerings. 13 A fire shall always be burning on the altar; it shall never go out. This is the ETERNAL FIRE, not some made up eternal torment. We know a literal fire burns no more on an altar in physical Israel. This is speaking of the WORD of God pricking the hearts of His people. God has raised forth in each generation those He has chosen to as priests on His kingdom. This true gospel is a fire when we are given ears to hear it in truth and in spirit. The hearts and mind of carnal man is the wood. The words of Jesus are eternal life and when they go out they never return to Him void if and when they are heard with God given ears to hear. These words of fire will accomplish all of His divine purposes in their appointed time. The carnal man has looked at the book of revelation thru fleshly eyes. They will use this verse that follows to support a total unbiblical view of an eternal torment. But they are yet carnal and know not the true heavenly things of God. Only God can give eyes to see these things. This verse is speaking to the righteous judgments of God that are already being experiences in the hearts and minds of HIS Elect, upon where judgment must begin. Those judgments, which are pure and which are likened to honey and even pure gold. The torment is in the hearts of men who must die to themselves and their self will so God can give them the new heart and pour His love into them. This is the suffering of the old man and the process of being crucified with Christ. The time period is not forever and ever, it says the eons of the eons and it means an age lasting period of time God has ordained for each of us. But eventually ALL THE WOOD will be burnt up. Pro 26:20 Where no wood is, there the fire goeth out: so where there is no talebearer, the strife ceaseth. Psa_106:18 And a fire was kindled in their company; the flame burned up the wicked. Job_31:12 For it is a fire that consumeth to destruction, and would root out all mine increase. Fires consumes and destroys the old man, the beast within, the carnal mindedness that represents all of us in the flesh. When these enemies of God and the carnal mind is at enmity with God, is burned up, then salvation comes. We overcome sin in our lives, getting dominion over sin via the earnest deposit, the down payment we have been given with Christ working in us, the hope of glory. The Lord will accomplish His purposes and will remake us all into new vessels. He does this with His word, the fire of God. These verses actually speak to the good news, the wonderful works of God to the children of men. In the end God’s love wins out and all men will be saved. It is by the crucifixion of Christ in us that we shall be saved in our appointed times. We must follow the Lord and go thru the process of judgment and become a living sacrifice to be saved in this life and then we must endure to the end and be found faithful. This fiery process is painful for the old man but it is by this fire that all the carnal thoughts and doctrines, THE WOOD, is burned up. What will remain is the pure gold refined in God’s furnace. Eternal hellfire is a lie and another jesus. Here is the truth about how long the judgment of God will last. The “eternal” fire that brought judgment to Sodom and Gomorrha are not burning today. That wood was burned up long ago. Jud 1:7 Even as Sodom and Gomorrha, and the cities about them in like manner, giving themselves over to fornication, and going after strange flesh, are set forth for an example, suffering the vengeance of eternal fire. The church fell away from the truth before the Bible was even finished being written. Doctrines such as eternal torment have simply been passed down for centuries leaving the carnal minded KJV translators no choice but to take words like Aion and Aionios and mistranslated them into eternal and everlasting. Here is a short article that shows this egregious error that has helped keep the multitudes blinded to the true Jesus. AION AND AIONIOS MISTRANSLATED But far greater glory remains for those who come to know God in this age. Such will not work via the strength of their flesh or the delusion of free will for their salvation. We will strive to stay on the narrow path and work out our own salvation, knowing that it is God who is now doing the work in us. Php 2:13 For it is God (not you, not your free will) which worketh in you both to will and to do of his good pleasure. Those precious few given the gift of faith (God’s Elect) will be striving to be found worthy to win the prize, to receive the reward of being in the first resurrection. So this I press onward for the mark and this HIGHER CALLING of God, that is given to just a few. Many will see their works burned up and exposed for the false gospel and other jesus’s they followed. But they all shall yet be saved in the very end. All God’s promises will come to pass. When something is consumed it disappears and ceases to exist. Hallelujah, death shall be no more!! The result of this is that all things will be restored to a pure, divine nature which defines the awesome God that I now serve. I cannot wait. 1 COR 15:54-57 “Death is swallowed up in victory.” 55 “O Death, where is your sting? O Hades, where is your victory?” 56 The sting of death is sin, and the strength of sin is the law. 57 But thanks be to God, who gives us the victory through our Lord Jesus Christ. Thank you Jesus for kindling your fire on this earth. Thank you Lord. I leave you with a Psalm excerpt that sums up the purposes of God’s fires. This is the good news, the Lord destroying the old man to bring forth the new man. Psalm 11:5-7 The Lord tests the righteous, but the wicked and the one who loves violence His soul hates. 6 Upon the wicked He will rain coals; Fire and brimstone and a burning wind shall be the portion of their cup. 7 For the Lord is righteous, He loves righteousness; His countenance beholds the upright God loves righteousness. Jer 23:29“Is not My word like a fire?” says the LORD, “And like a hammer that breaks the rock in pieces?